Today organizations spend a lot of time and money in managing outdated technologies. Application maintenance is something that is expected by technology partners or technology providers. Manvish application maintenance services are custom designed for maintenance purposes and are scalable to the needs of a customer. We take a consultative approach with a holistic view of technology, platforms, data architecture, technical teams, and applications. We engage with customers to understand their business domain, development roadmap, platforms, technology, process and applications, and then deliver services. We implement a proven methodology process for application maintenance which includes support on existing application, techno-functional support for present and future application enhancements. We ensure that the maintenance services enhance application performance and stability, which in turn results in lower support costs and reduced total-cost-of-ownership. Application maintenance often takes the largest share of an IT budget, leaving limited scope for new development. It also requires expertlevel knowledge to identify production issues, frequently dividing the attention of key software engineers. 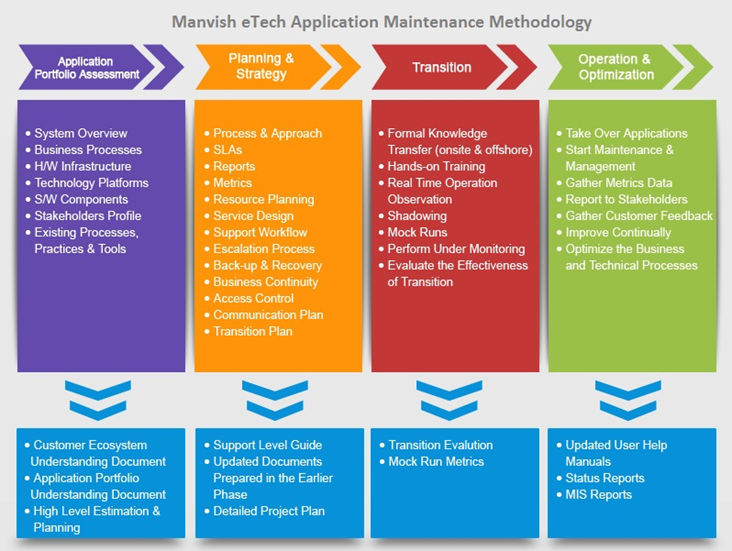 Manvish Application Maintenance Service helps you reduce maintenance costs while optimizing performance and quality of critical applications. Application Maintenance also frees up your expert resources to take on the proactive development initiatives that boost your top line. Manvish application maintenance process allows for effective capture, reporting and resolution of maintenance requests. The process leverages the global delivery model wherein work responsibilities can be effectively distributed among various organizations depending on the criticality of the requests. Each of these activities are governed and monitored by an SLA framework. Manvish was started in the year 1999 as an IT services, solutions and IT Consulting Company to help enterprises transform into digital workplaces & improve process efficiency. Manvish eTech has over time diversified its operations and grown into one of India's premier organizations, developing sophisticated hi-tech hardware & software products. We provide embedded solutions, enterprise resource planning, engineering solutions, content development, web services, software services & solutions to basic service providers or clients, all with a complex network/cluster of service centers. An excellent process methodology brings home the advantage of delivering solutions on time, every time. Manvish eTech has also developed indigenous customizable hand held computers, which can be used in multitude of applications, and these products are available through direct selling, resellers, channel partners, and authorized representatives.